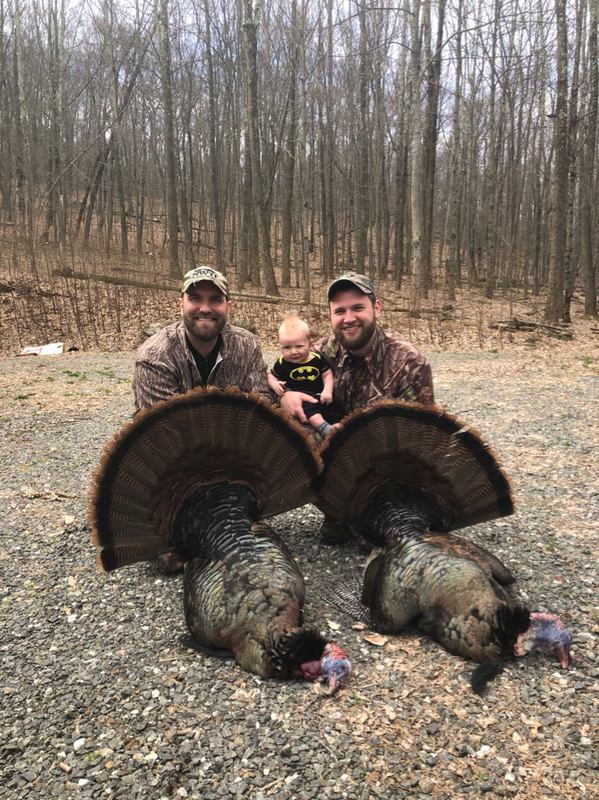 Bishop and I did the state land grind the first 3 days of season and ended up with one tom the second day and a double the third. Keep reading for the long version. We didn’t hear much but held tight calling every so often. Besides a shot around 5:45 it was pretty quiet. After a couple hours, we decided to head out and make some loops around the fields and maybe put a stalk on one. Not long after we saw the group we were after and the tom cross the road. We made a mad dash up a hill to cut him off. I stayed back and kept him gobbling while Bishop tried to get closer. Not sure what happened, maybe he saw one of us and spooked. Called a it a day. Birds gobbling in the vicinity. I kept the calls light and tried playing hard to get. After about 10 minutes gobbling the roost I heard one fly down. I soon noticed a hen to my right. I thought I heard more walking but couldn’t see any more birds. I leaned my head over to see around a tree and here they come single file behind the tree. Taking mental inventory I was seeing hens and a big red head. I waited for him to turn so I could confirm he was a mature bearded bird and as I shifted the gun, the lead hen spotted me and started the alarm putt. I was able to get a shot off before they were too spooked and left. I didn’t see him go down figuring I’d missed threading the shot between some trees. No sooner than I think that, I get a text from Bishop “perfect”. Sorry bud, I missed. He had seen the big boy fly down and headed my way. Well then we both heard flopping. Weird. Flopping but don’t see a bird. I got up from my spot and started looking around while Bishop made his way to me. After a few minutes of describing the replay Bishop looks around and finds the bird. Nice 2 year old that loved to gobble on the roost. We headed back down to the truck and while Bishop was shedding a layer, I cranked on the box call and fired up 2 other birds. We we scrambled to get geared back up and headed after them. Bishop took the lead and I hung back and tried to keep them talking but they kept gobbling and moved off. At one point he saw a red head at about 20yds but couldn’t tell Jake or Tom and held the shot. We decided t go grab breakfast and come back and do another loop. Met a fellow turkey hunter in the parking lot and shared a big breakfast and swapped stories. When it came time to pay, he paid the tab which was an awesome surprise and topped off the morning. With full bellies we did another loop and didn’t get any more birds going and headed home and Bishop off to work. Went to a different state land spot we’ve had tremendous success at but it’s a long hike. We got set up and watched a great sunrise come up in the east. We know where these birds pop out of the woods on private and head toward a private field. Sometimes we’re able to pull them up to us on state. Eventually we spotted a strutter in the binos and another and another and another along with some hens. The big boys seemed totally content following the hens strutting the whole way and gobbling. The group split off and a hen headed our way with two big boys in tow but she disappeared over a knoll about 100 yds out. The boys kept strutting and gobbling up the trail to our Strutter Jake and hens setup. It felt like an eternity as they’d stop, gobble and strutting at every crow, dump truck beep, etc. at about 40 yds they started to break off the trail and head our way. At about 35 we did the 1,2,3 shoot and put them both down. What a hunt! This was our third year in a row doubling and it’s doesn’t get old. Of course we had to include my 2 month old in the photos haha. 12 years is going to be a long wait for his turn to tag a turkey. Last edited by ctrider; 04-28-2018 at 06:11 AM. Nice job boys...some good looking birds!! Congrats on the nice gobblers, your boy looks like he wants to hunt with you now. I can't wait to get out. Congrats on the double. As always the opening 4 days were awesome! Nice work to get some nice birds. The 12yrs will go faster than you think. Mine is nearly 8 already and it seems that just a few weeks ago I could hold her on my forearm.